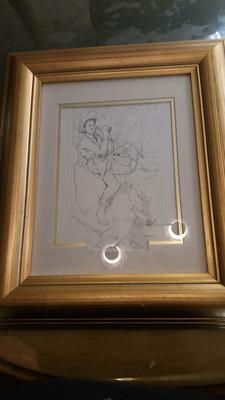 "THE ORIGINAL OLD OAKEN BUCKET STUDY SKETCH OF THE MISSING COCA-COLA NORMAN ROCKWELL "
Private Collector: I bought this art work on Tuesday, February 28,2017 from a private seller from Richmond, Kentucky, United States, The seller stated that this is a original Norman Rockwell sketch. 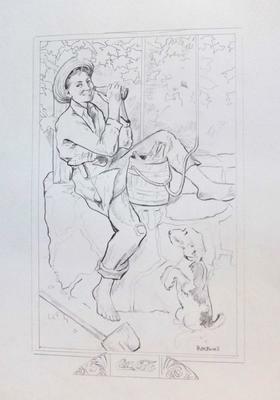 Catalog / Additional Details: The original Old Oaken Bucket study sketch of the missing Coca-Cola Norman Rockwell old oaken bucket painting. "The Old Oaken Bucket," 1932 - A boy is sitting on a well with a small wooden barrel of bottles of Coca-Cola in his lap. pieces were left at the printers or agencies and never returned to the company. In fact, all three pieces of Coca-Cola Norman Rockwell art that were used in finished ads were found and acquired in the last 25 years. We call the other three the “Missing Rockwells,” and they have even been highlighted on Antiques Roadshow. We are still searching for the these three Rockwell works, which were created for Coca-Cola in the late 20s and early 30s. Two were used as billboards, and one was a calendar – but the original art is still missing. The Unwanted Rockwells: The highlight of the exhibit is a series of seven additional paintings that were created and rejected as proposed Coca-Cola ads or used as study sketches for a finished ad. The Coca-Cola Company obviously held Rockwell in high esteem; he was one of the few artists we let sign his works and have his signature included in print ads. So there clearly were strong reasons for rejecting any work Rockwell created for Coca-Cola. These items have been in the hands of private collectors and most have never been on display before. Norman Rockwell's painting process was first to photograph the models and backgrounds. Second he developed one or several charcoal drawings (drawing pencil, sketch study.) Last came the actual oil painting.